Richard Branson is one of the most famous entrepreneurs, and he is not stingy with his advice and success secrets. Richard left school at 16 and started his own magazine in cooperation with his friends. When he was 20, he launched the Virgin Records recording studio (later a major record label) and subsequently created Virgin Group. In his 30s he started Virgin Atlantic, Virgin Mobile, and Virgin Trains. Virgin Galactic, by the way, is one of the two companies in the world that can offer space tourism. Not bad for someone who didn’t even finished high school, right? The entrepreneur talks a lot about success and surely can give a lot of good advice, but we have chosen his most prominent ones. If you have decided to start your own business, make sure that it is somehow related to your hobby or things you like. Do not create a business just for money, or because “that stuff” is trending now. He believes that many people have bright, interesting ideas, but unfortunately, only a few of these many people can make them a reality. Others think that they just do not have any new or innovative ideas, or their ideas are already implemented by other people. These people are afraid of bankruptcy and taking risks. Branson started his own business when he was 16, and it was a journal. Once he wrote to all the celebrities he knew and asked them for an interview. Only a couple of them answered him, but they did! The lesson is that you have to be persistent and not afraid to fail. An idea has to be a passion. Furthermore, it’s better for you to learn how to share your passion with others. If your idea is really good, you must be able to describe it in brief (two or three sentences). But do not forget that your idea, one way or another, has to be better in some ways than a similar one from your competitors. It makes no sense to start an ordinary airline. There are many similar airlines, indistinguishable from each other. That’s why Richard has created an airline that is better the competitors’ ones in many ways. He is entirely sure that if someone doesn’t enjoy what he does, it is a sign to move on. Richard says that enjoying what you do is the main part of any job. And it is not only about you. Make sure that your team or just people you are working with enjoy it as well. It is vital not to give up after the very first failure. And there will be failures, that’s for sure. Branson used to say that an entrepreneur’s life is a lot like a traveler’s one. Sometimes you find yourself with your back against the wall, cornered. You may feel that the chances of solving that problem are extremely small. Just don’t give up and find the strength to get over it. Nowadays the pace is too fast and it is essential to have the ability to recover from the failure quickly. Richard says that he creates tens of lists every day, and he believes that this is exactly the thing that distinguishes a successful entrepreneur from a fruitless one. The details are too important to neglect them. 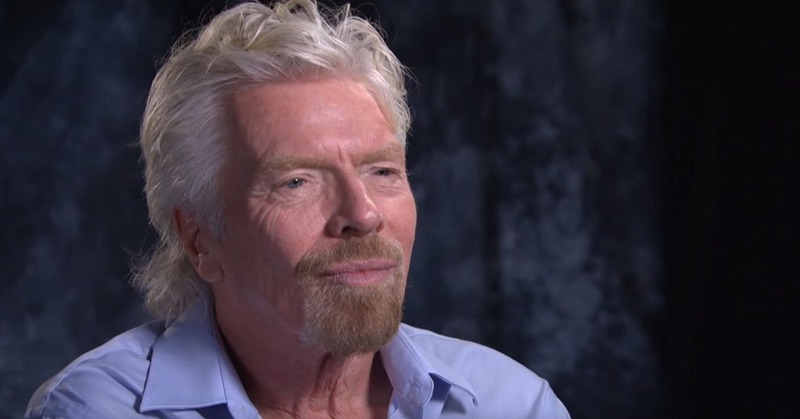 Branson also says that it is healthy to set goals. Moreover, it is imperative, even if goals are small. It does not matter whether they are long-term or short-term, either way, you need both types of aims. Write down the objectives for the year at the beginning of the year, goals for the month have to be written down at the beginning of each month, and so on. It helps to improve continuously and move on. Richard’s mother taught him not to look after the lives of others, but live his own, when he was a kid. It seems like really helpful advice. Life is too short and interesting to waste it on watching TV. As corny as it sounds, but you only live once. That’s why Richard Branson says that he will only do what he loves. You may say something like, “Come on, this man has an island in the Caribbean, of course, he can do what he loves,” but years ago this very man literally lived on the sofa in his kitchen. And he claims that even then he was happy. He also likes to say that the secret to happiness is quite simple: if you have a kitchen big enough to put a sofa in, bedroom, and a person you love, everything else is only an issue of secondary importance. In addition, if you do what you really love, the result will not be long in coming and will surpass your highest expectations.